NOV23 0900PST. November's rally in precious metals, among them silver futures (SI), is witnessing another leg upward in today's trade. 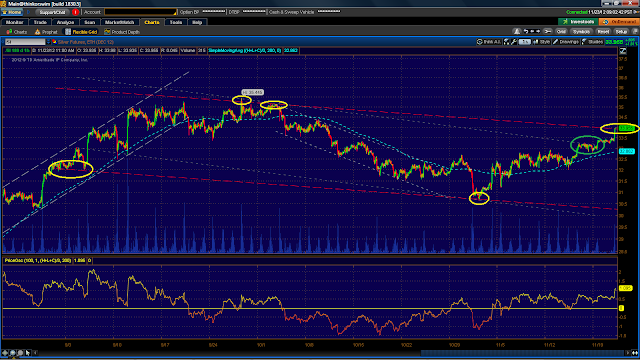 The contract is presently at 2-month price channel resistance, with the channel marked below in dashed red. Of note: the red dashed channel is not particularly robust, being both rather minimally defined and with long stretches through "empty space." As such, price's current pause at the channel may be temporary; bullish sentiment may propel price higher, as it did earlier this week, when price broke through another 2-month price channel, marked below as a lightly dashed, grey line. Incidentally, the break of the grey channel provided an excellent buy point from which to partake in today's rally. SI. Aug 27, 2012 to present. Hourly candles. Note: equities traders can reflect their outlook on silver futures by taking a position in the SLV exchange-traded fund, formally titled the iShares Silver Trust.